The hundreds of former South Wales steelworkers who lost their pensions when ASW went bust will be ecstastic to hear news of their former boss. Graham Mackenzie, who left the company just before it went bust in 2002, has a nice new job in Wolverhampton. Mr Mackenzie OBE will chair the proposed new Wolverhampton Development Company. On Mr Mackenzie’s departure from ASW, the Western Mail reported that he “had overseen a decline in the company’s fortunes as it battled to cope with a multi-million pound debt and oversupply in the global steel market”. Let’s hope he fares better with the jobless of Wolverhampton. Downing Street’s failure to call for a ceasefire between Israel and Lebanon last summer has been criticised by the foreign affairs select committee. MPs say a better response in July 2006 could have reduced casualties during the 34 days of slaughter. One politician who did speak out was Pontypridd MP Kim Howells. Howells, who is not always appreciated at What Is Wales?, did at least react when confronted with the evidence of Israeli attacks. “The destruction of the infrastructure, the death of so many children and so many people. These have not been surgical strikes,’ said the Foreign Office Minister on a visit to Beirut. His words fell on deaf ears in London. Tony Blair is now a peace envoy to the region. Still hard to believe that’s not a joke. Enough to make someone, somewhere die laughing. But, oh Kim, your remarks last year, still baffle. Admitting Iraq was “a mess but it’s starting to look like the sort of mess that most of us live in” should surely qualify you for some sort of extended lie down in a dark room. At least 200 dead yesterday, Kim. Eight million Iraqis in need of emergency aid, according to Oxfam. It’s not a mess, is it? It’s a tragedy. And looks nothing like where “most of us live” or would want to. Continuing this theme about the strange words used by the arms trade, it is interesting to note that BAE Systems has just announced a first-half profit rise of 27 percent. Thanks to its upgrades of Bradley fighting vehicles for the US army in Iraq and production of fighter jet parts, its net income rose to £515m. On the campaign concerned with the military training academy at St Athan there is more in the current issue of Big Issue Cymru. And for a lot more information on the campaign try here. Peace activist Dr Margaret Jones made some headlines last week when she was sentenced for breaking into a US airbase prior to the bombing of Iraq. Dr Jones was given a six-month curfew order and ordered to wear an electronic tag after her trial at Bristol Crown Court. The 58-year-old university lecturer used hammers and bolt cutters to disable fuel tankers and trailers used for carrying bombs at RAF Fairford. She did it to prevent the “murder of innocent civilians”. The Daily Telegraph, one of the newspapers to report her trial, gave the story 143 words. In the same week some of the devastation which Dr Jones had been trying to stop came to light in an Oxfam report which described how eight million Iraqis – almost a third of the population – were in need of emergency aid. It said that 43 per cent were living in “absolute poverty” with malnutrition rates in children have risen from 19 per cent before the 2003 invasion to 28 per cent now. Nine out of ten Iraqi children show learning difficulties related to psychological trauma. Seventy per cent of Iraqis are without access to adequate water supplies and 80 per cent lack effective sanitation. The Oxfam report painted a devastating picture of a country in such a dreadful state of breakdown that it is impossible for us to imagine the lives of many there. Number of words on this report in the Daily Telegraph? None, I’m afraid. 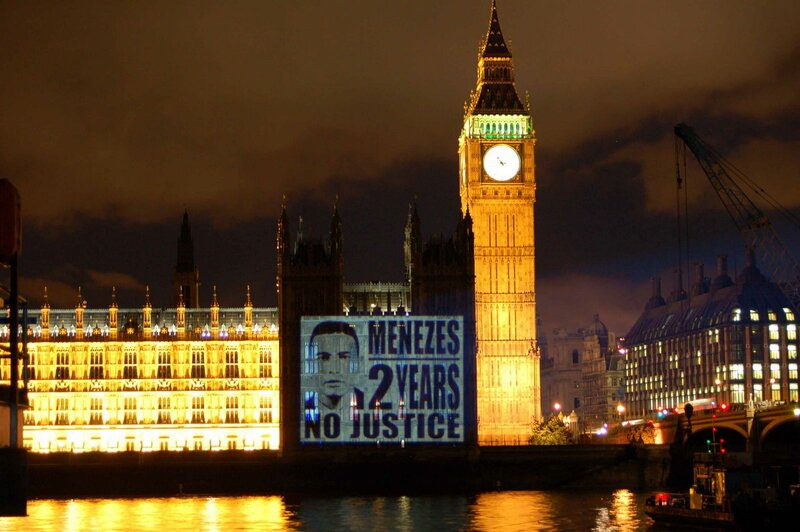 While top police officers scrabbled over their careers, there were two things that stood out from the Independent Police Complaints Commission (IPCC) report into the shooting of Jean Charles de Menezes. One, because its inclusion illustrates the stark tragedy of this story. The other because it appears not to have been tackled by the IPCC at all. Firstly, the police gave the 27-year-old Brazilian no instruction “that an innocent man would have understood” before shooting him seven times in the head. He died in the most brutal and terrifying fashion. Secondly, that the police were operating a new policy, known as “Operation Kratos”, in which they did not give warnings before firing (a strategy partly developed by Barbara Wilding, of South Wales Police). This was not tackled by the IPCC in favour of clearing Sir Ian Blair and dumping on Andy Hayman. However, if the police had still been operating its usual shoot-to-stop policy – effectively a shoot-to-kill but with a warning – Jean Charles would still be alive today. Firstly, no it wasn’t the picture that first drew me to this post on Guerrilla Welsh-Fare. It’s just that it is always so lovely to read about Chris Bryant, as it gives me a chance to relate my favourite stories. Now, seeing as he is tamping at the priority given to Welsh words over English ones at railway stations in Wales, let’s look back at what last rattled his cage. Back in January he was miffed at Jill Evans and Leanne Wood’s anti-Trident protests. As I said at the time it is interesting to note what the former churchman sees as ‘childish politics’. As did Bryant, but not by answering the question.